There are many reasons for tooth loss, including poor diet, lack of proper oral hygiene, and traumatic accidents. Complete and partial dentures are used to replace missing teeth and are often more affordable than implant replacement. For many people, dentures can be a very acceptable option to replace missing teeth. Used to replace several missing teeth, partial dentures utilize remaining adjacent healthy teeth to help stabilize and secure the fit of the appliance. Removable partial dentures can also use implants or other attachments for anchorage that fit around remaining natural teeth. Complete dentures are used when an entire arch of upper or lower teeth are missing. They are designed to rest on the bone and gum tissue and function to support facial structure, chewing, and speaking. Complete dentures can be supported by implants as well, improving their fit and stability. They are made with materials that mimic natural teeth and gum tissue in appearance for a natural look. Proper care of partial or full dentures is important to keep them looking great and functional. Removable dentures should be taken out before bed, cleaned, and kept in a safe location. Make sure to use denture-safe paste for cleaning as regular toothpaste may be too abrasive. Approved tablets can also be used if dentures are left to soak overnight. It is important that dentures are not allowed to dry out. This could cause the material to become brittle or change shape over time. Cleaning dentures with water that is too hot can also cause minor warping. In both cases, even the smallest change to the fit of the dentures can cause discomfort and decrease the effectiveness. 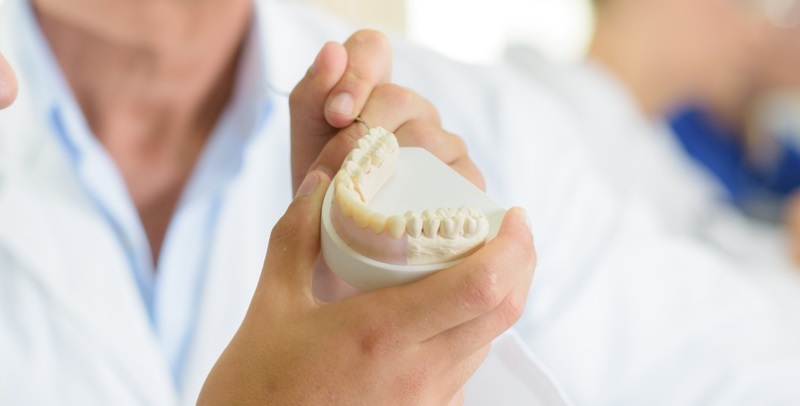 Have questions about dentures for replacing missing teeth? Call us today. In addition to a variety of denture solutions, Creekside Dental provides a wide range of dental services. We have been providing family dental care for more than 25 years in the Vancouver and Clark County areas.